You may hear constantly about how my generation only had a few channels to watch. Well, the generation before mine had even less, and at least whenever money was coming in we occasionally had cable. But, even when we didn't, there was at least one or two independent stations in the market that played re-runs of I Love Lucy, The Andy Griffith Show, Gilligan's Island and on and on. Point is, although these shows had come and gone before we were born, they were still part of our weekday afternoons when we couldn't go out to play. We saw them often enough that, although there was a 20 to 30-year gap, they were still part of our culture and our memories once we began to get older. 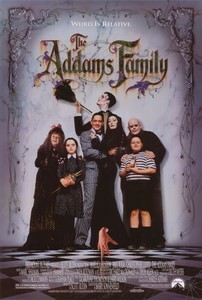 The Addams Family was one of those shows. Phil Tucker is nowhere near as well-known as Ed Wood, Jr., but he is similarly known for giving us a classic of bad filmmaking: Robot Monster. Put a diving helmet on a guy in an ape suit and... instant movie! To be fair, a number of 1950s monster films consisted of a few brief filmed shots, following a well-worn plot and relying mainly on narration and stock footage. The fact that almost any cheap thing could get kids to spend their allowance on a Saturday meant that more of these cheap films received distribution than would today. After all, quality usually didn't matter, since most of the audience was more interested in exploring each other rather than watching the film. 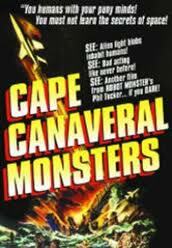 That said, it is a testimony to the awfulness of Robot Monster that it is still well-known today. Rarely does a Hollywood remake of a foreign film get any praise from the director that made the original. 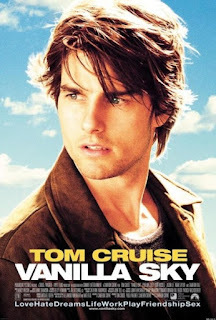 While Vanilla Sky did not get overwhelming critical praise when it opened, Alejandro Amenábar, director of Abre los ojos, said that this film was a complement to his original. Two different, but they work together. Though it still did decently at the box office, what it did largely was confuse and infuriate a fair share of its audience. Tom Cruise was already losing people with his continual decent into Scientology. His involvement in the frustrating final movie from Stanley Kubrick, Eyes Wide Shut, and the overexposure of his failing relationship with Nicole Kidman were doing more than a little to wear out the welcome of what was, at the time, the highest paid actor in Hollywood. Rarely is the solution to raising money for the movie you are making, once it goes over budget, is to make another movie. Such is the tale behind The Eagle Shooting Heroes. Famed Hong Kong director Kar-Wai Wong was trying to finish his movie Ashes of Time, and rushed production of this one, using the same cast members, in time for the Chinese New Year celebrations. I have not seen the other film, but both films take inspiration from Louis Cha's novel The Legend of the Condor Heroes. In this instance, it goes for parody. Again, I find myself at a bit of a disadvantage not knowing the source material, but this is light-hearted and strange enough to overcome that problem. 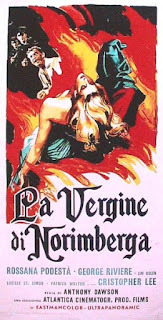 Mario Bava is largely known for his horror films, and rightly so. 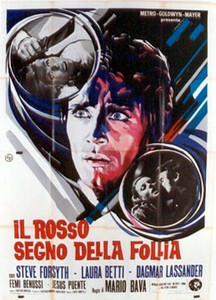 It was largely he that set the foundation for Italian horror, as well as for giallo suspense films. That didn't mean that, like most Italian directors, he didn't take on jobs for hire from time to time. Knives of the Avenger was toward the end of production, but it was running over budget and causing a headache for the studio. 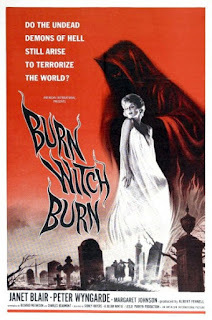 After firing the original director, Bava was brought it to complete the film. Instead of just completing it, he rewrote it and refilmed it in the course of three days. The result? 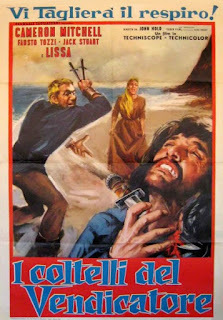 A halfway decent blending of sword and sandal adventures with the sensibility of a spaghetti western. 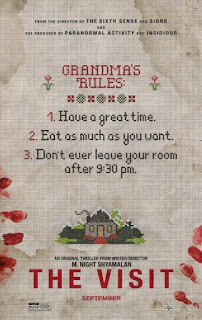 I really don't think I have to go into how much M. Night Shyamalan has become a bad punchline in movie making. He has fallen quite a bit since The Sixth Sense, most recently before this directing the Will and Jaden Smith vehicle After Earth, which bombed spectacularly. That movie, to Shyamalan's credit, was more the fault of the Smiths, since he was only a hired hand this time around. He took that money and decided to see if he could start all over again with The Visit. Instead of blowing a ton of money (and potentially having the film taken away from him again), he decided to make his own visit into the realm of found footage. It's usually a good move, since even if the movie turns out to be horrible, the profit margin is still going to be huge. 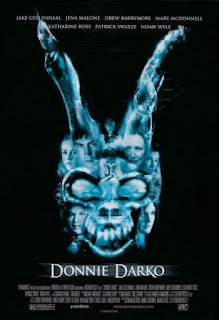 I have seen Donnie Darko in both of its iterations. I originally saw the director's cut, and I truly liked the way the CGI was largely used to try and piece together much of what was happening in Darko's life. Upon seeing the original theatrical version (as wellRichard Kelly's other major movie, Southland Tales), I have to say that the original, though more confusing for some, is the better one. Christmas horror films can be summed up two ways: Silent Night, Deadly Night and Black Christmas. Both slashers, the former largely cashing in the genre while the latter one of the earliest examples (and directed by Bob Clark, who would also do Christmas Story). They are genre classics, but at least Silent Night's killer in a Santa outfit became highly controversial. 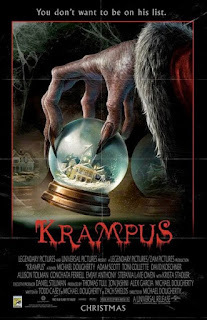 It seems like the only movie to get mainstream appeal combining Christmas and horror was The Nightmare Before Christmas, and there is still a lot of argument about whether or not it is a Halloween or a Christmas film (I say both). Since his name is so proudly displayed on here, I first thought this film was directed by Dario Argento. It confused me because I didn't remember him doing a movie called The Church at this point in his career. This would have still been during the waning years of his most creative period leading up to Trauma, and I've pretty much seen what he has to offer at that point. 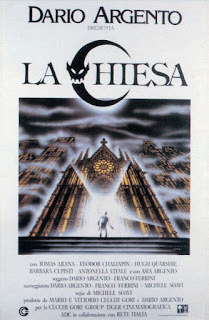 Instead, this movie is directed by Michele Soavi, who five years later would direct Cemetery Man, which was one of my first introductions to Italian horror. Cemetery Man was sort of a weird experience for me at the time, largely because it was advertised in the U.S. as a straight zombie film, with no mention of it being from an Italian director. The atmosphere, and particularly the ending, were a bit of an obstacle for me until I got a bit older and started appreciating that style of cinema a bit more. Lucio Fulci's string of famous horror films began with Zombi, which was a pseudo-sequel to George Romero's Dawn of the Dead. From there, his movies became known for their high gore content and dreamlike atmosphere, but not so much for coherent plotting. 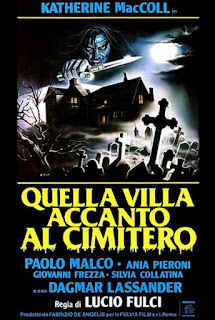 Viewers who appreciate that in Fulci's other horror films will find that The House by the Cemetery is quite a bit more staid, but still with some twists. Lucy (Catriona MacColl) and Normal Boyle (Paolo Malco) move from New York to a small town in Massachusetts. Prior to the move their son Bob (Giovanni Frezza) sees a girl (Silvia Collatina) gesturing at him from a picture of a large house and telling him not to come. His mother dismisses his fears, but is surprised when she sees the house they are moving to is the same one as in the old picture. 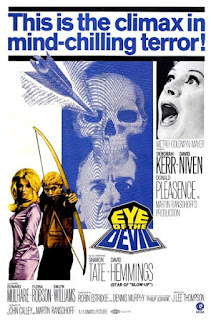 For me, Mario Bava is a name that should be mentioned next to Federico Fellini and Sergio Leone when we are talking about great Italian directors. Sure, he may have been largely a genre director. His narratives are relatively straightforward, we don't get sweeping vistas and epic storytelling. We do, however, get imagination and, despite being a genre director, a stubborn defiance of being stuck in any one. That brings us to Hatchet for the Honeymoon, which itself refuses to stay within one genre. Fashion designer John Harrington (Stephen Forsyth) is rich and successful. He is also happy to tell us that he is a madman. If we need further proof of that, we are introduced to him dispatching a happy couple on a train following their wedding. When you hear that a lead actor like Christopher Lee had to improvise most of his lines while dubbing the film afterward because the woman in charge of continuity lost his script you wonder what kind of movie you might be in for. Truth is, Lee starred in so many of these movies as a villain of some sort that his lines were probably interchangeable from movie to movie. What amazes me is that he even remembered doing many of these quickie films. 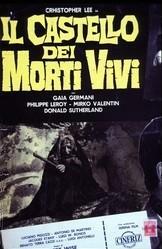 This one is an Italian production which is also known for being Donald Sutherland's movie debut. The director, Warren Kiefer, is best known for being his son's namesake. 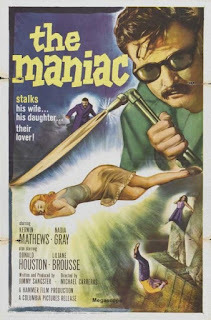 I am always excited when I run into something from Hammer that I haven't seen before, and even more so when it isn't a Gothic horror tale or monster movie. The studio did try to branch out where it could, and often times they succeeded, even though many of the films outside their normal ouvre get ignored these days. Then, of course, there are those which are forgotten for a reason. Annette Beynat (Lilianne Brousse) is sexually assaulted by a neighbor who gives her a ride home from school. A schoolmate runs and gets her father, who hauls the offender back to his blacksmith shop and goes to work on him with a blowtorch. If there is one thing that I have been surprised about, it's that the 3D craze finally became a viable, and marketable, method of presenting movies. The reason I am amazed is that it has been tried a number of times, and each time it was a short-lived gimmick. The 1950s were the first time it was attempted on a mass scale. Most of these movies are forgotten, as the gimmick often outweighed the movie. At this point, the remake of House of Wax with Vincent Price is one of the few such that still gets any play from this period, and that has less to do with how it was presented and more to do with how great Price is as the villain. 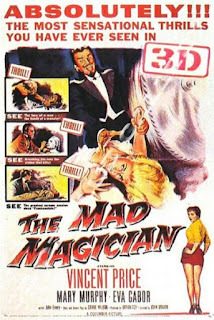 It was largely Price that drew audiences at the time, and so they decided to rush out another 3D movie with him it. This is an example of a production that went through the wringer. It had been in the planning stages since 1964, and was actually finished and ready for release in 1966, but for some reason it was shelved. That's why you may be wondering why it says this film is introducing Sharon Tate, when you are sure a movie with her came out before this. It turns out this was made first, but it took some time to come out. Another thing that delayed it was that Kim Novak was supposed to be the female lead. She largely did film her parts for the movie, but was injured when she fell off a horse, leading to her being replaced by Deborah Kerr and all that filming having to be done again, only to have the film shelved. Whatever the reason it finally got released (most likely because David Hemmings had just got some major notice with Blow-Up), it is good that it was, even if it is another typical "aristocrats in a castle with a secret" movie. Although many people have long lamented the death of drive-ins, one of the best things to come of the 1980s was direct to video movies. Occasionally these were of high quality and just didn't have enough of an audience to warrant a theatrical release. Other times they were the equivalent of the poverty row movies of the 1940s or many of the b-movies that were churned out in the 1950s and 1960s that seemed to be mostly narration over stock footage. Then, of course, there are the bandwagon films. They are still around, but they tend to get stuck on DVD or the SyFy Channel, where people typically know what they are getting into. Back in the age of drive-ins and when going to the movies was a typical weekend diversion? 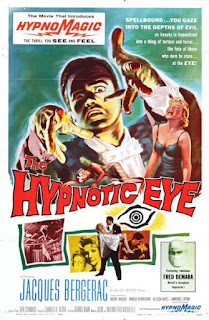 Well, the theaters were jam-packed with quickly manufactured trash like The Hypnotic Eye, which does its best to rip off William Castle, of all people. Andy Warhol, and members of his entourage, were making short films that were distributed on the underground circuit as far back as the early 1960s. I know there is an ongoing project to rescue as many of them as possible. Still, although Warhol's name is all over them, Paul Morrissey is the one most associated with directing the movies that bear his name. The other name most associated with these films is Joe Dallesandro, a traditionally handsome leading man with an almost Greek physique that received attention for two of Morrissey's previous films, Trash and Heat. These were earned both the director and actor some critical accolades. So, what's next? Of course! Run off to Italy and update the Universal movie catalog. I could have sworn I was watching a William Castle movie when this came on. For a movie that obviously wants to be taken seriously, I cannot honestly say why they would open with a narrator casting a fake "spell" to remove evil spirits from the screen. 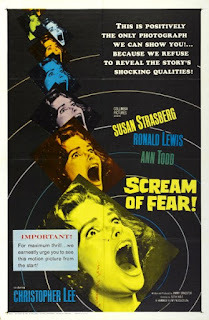 American International may have been a studio that churned them out, but, at least in the '60s, most of it was quality. This movie is as well. It is just that when you get a campy opening like that you expect something cheap, and not a production that questions the power of belief and leaves a number of things hanging about what is real and what is not. It was originally called Night of the Eagle, which sounds eerily like Night of the Demon, a movie that it shares more than a little with. Hammer is well-known for its adaptations of the old Universal horror menagerie, often featuring Peter Cushing and Christopher Lee. There is a certain type of style that one typically expects from the studio, from Gothic settings to lurid sexuality. Occasionally one of their movies bucks this trend. After her companion dies in a freak swimming accident, Penny Appleby (Susan Strasberg) accepts an offer from her estranged father (Fred Johnson) to visit him at his estate in Nice. She is greeted by his handsome chauffeur Robert (Ronald Lewis) and her stepmother Jane (Ann Todd). Penny never really knew her stepmother, nor did she approve of her father remarrying, but she does her best to get on. I am constantly amazed by the amount of material that has come from Italian cinema. For an industry that, except for a few well-known names, has never achieved the prestige that France has, I am always discovering new films that have somehow slipped by everyone over the years. Horror Castle, also known as The Virgin of Nuremberg, is one of those, and happily someone in the mid '00s saw fit to dig it up and restore it. Mary Hunter (Rossana Podesta) is an American woman who has just moved with her German husband Max (Georges Revière) to his ancestral castle. Three centuries prior the castle had been notorious for a man known as the Punisher. Rather than a skull t-shirt, he wore a traditional executioner's hood and tortured women to death. Many of the implements of torture remain in the castle, including the Virgin of Nuremberg, an iron maiden like device. Also present is a statue of the Punisher. Throughout the 1960s and early 1970s artist Andy Warhol branched out into film making, largely with the assistance of director Paul Morrissey. 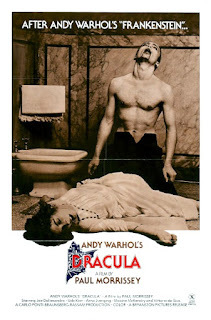 I say that because, if you came searching for this movie under its larger release title of Andy Warhol's Dracula, you are going to be sorely disappointed to find out that Warhol neither starred nor directed this film. Morrissey and Joe Dallessandro were part of his inner circle, so you might say that Morrissey's films were large inspired by his aesthetic, although the main Warhol contribution is a (small) infusion of cash. 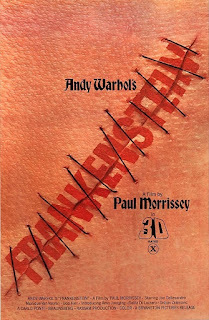 That said, this was done largely to cash in on the underground success of Flesh for Frankenstein, also known as Andy Warhol's Frankenstein, which had been released a year prior and also directed by Morrissey. Filming had gone well, so they decided to do another one and take advantage of filming locations in Italy.